What is Unión del Barrio? Unión del Barrio is an independent political organization operating with a volunteer membership base and entirely self-financed through membership dues, community contributions, and local fundraising. 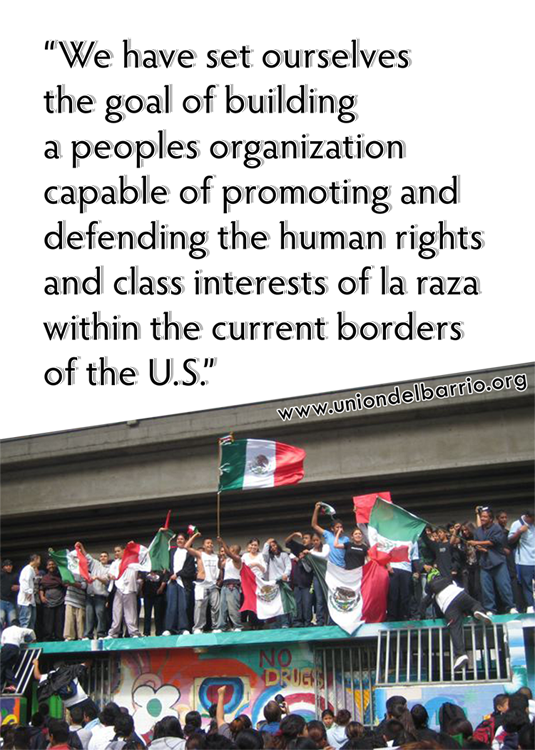 We have dedicated ourselves to struggle on behalf of “la raza” living within the current borders of the United States. Unionistas do not take our struggle lightly. Today, our communities suffer under terrible conditions. The degree of hatred and political poison our people are forced to endure is unprecedented. Every year hundreds die attempting to find a better life north of the border, and every month thousands are detained and deported. ICE raids break up families. Unaccompanied children are detained and deported. Our labor is exploited. Schools deny us a quality, relevant education. Tens of thousands of our young people are corralled into prisons while thousands more are sent to fight imperialistic wars. Nearly all of our human and civil rights are being stripped away. Our electoral power is being aggressively diluted. The present reality is as terrible as it is unsustainable, and the U.S., Mexican and too many Central and South American governments offer nothing more than budget cuts, privatization, increased political repression, militarization and even death. Unión del Barrio is convinced that our future must be different. We have set for ourselves the goal of building a peoples organization capable of promoting and defending the human rights and class interests of la raza within the current borders of the U.S. The only possibility we have for securing a better future is to win our self-determination as a people. We support the struggles for freedom of all our sisters and brothers across Latin America which we consider a part of “Nuestra América,” and we unconditionally uphold the right of self-determination of indigenous people, and of all poor and oppressed people throughout the world. Furthermore, we recognize that the absolute and unequivocal liberation of mujeres in México and Nuestra América is a fundamental component of our struggle for liberation as a people. Fundamental to any liberation organization and pro-independence conscious movement is the absolute political, social, and economic equality between women and men. Since 1981 Unión del Barrio has led struggles to resist migra and police violence; defend the rights of workers, prisoners, mujeres, and youth; and even launched numerous independent electoral campaigns. Our movement is based on national, continental, and class liberation for la raza in Aztlan/México Ocupado, and throughout Nuestra América. We call this ideological position Mexicano Revolutionary Nationalism & Raza Internationalism. Now, more than ever, we need you to join Unión del Barrio to help build this movement for Raza Liberation!